The Inventory Tracking Software of Tomorrow! This isn’t your Typical Warehouse Management Software Solution. We are Taking the Logistics Industry to Higher Grounds by Providing a Visual, Bird’s Eye View on Inventory Management. Never misplace inventory again! Warehousing has been done the same way for decades; simple manual data entry into a legacy system or paper based. These common classic methods of inventory tracking are the leading causes of why warehouses today encounter inaccuracies and timely mistakes when being managed from start to finish (I.e. receive, store and ship). Today, warehousing technology has grown into something exponential and innovative eliminating these deficiencies, improving the overall success of your productivity. Considering the next generation of technology entering a more visually interactive state it is expected to see our workforce entering the same changes providing ease-of-use ensuring all tasks completed are completed efficiently. As the Pioneers of Visual Pick Technology, Systems Logic ensures every client is supplied with the latest optical logistic innovations for your warehouse. Our optical logistics solution is more than just imagery of your inventory; it’s the ability to have complete visible traceability over customer inventory. All from the palm of your hand, you will have detailed contents and specifications to a pinpointed location within your logistics facility giving your floor operators an illustrated bird’s eye view of your entire warehouse. Warehousing today has evidently proven that simple data displayed on a mobile device is not sufficient in terms of minimizing inaccuracies and errors. Through our experience in the logistics industry, we have tapped into the mind of multiple floor operators giving us an inside look into how their memory and actions function when using data versus visual imagery when completing everyday warehouse tasks (I.e. picking, sorting, etc.) when managing inventory. Through research and example, it has been determined that 83% of human learning occurs visually – A piece of information that cannot go unnoticed with working with inventory control. 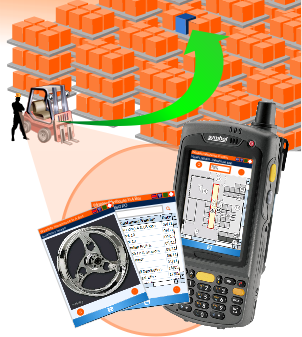 As the Pioneers of Visual Pick Technology, we have made the comprehension of our WMS (Wireless Warehouse In A Box™) inevitable; the barriers involved with textual understanding are eliminated – Bring out the potential of your employees. Refrain from lengthy training and the trade of tribal knowledge; our visually complemented WMS is extremely user-friendly creating functional operators out of first time users within a small period of time. A simple and concise tool with a magnitude of capability when placed into anyone’s hands; give your logistics operators the ability to track customer inventory with confidence provided to you by the Pioneers of Visual Pick Technology. Wireless Warehouse In A Box™ – Your Revolutionary turn-key Warehouse Management Software capable of providing you with complete power and control over your warehouse. As the Pioneers of Visual Pick Technology, having visually enhanced capability has always been fully integrated into our WMS software and will continue to grow with our technology advances and innovative technology breakthroughs. At Systems Logic, we want to ensure that operations completed are systematic and flawless leaving inaccuracies at the doorstep. Change the way you currently manage your warehouse into the way you want your warehouse managed — Accurately, Mobile, Efficiently and Visually. Precisely Identify products based on their particular attributes (I.e. Quantity, Type, Size, Shape, etc.). The implementation and use of visual imagery on your mobile device in warehouses today result in significant improvements to your daily logistics, operations and annual labor costs equating to literally thousands of dollars in cost reductions. Having a Warehouse Management System with the capability of doesn’t just manage your warehouse, but thrive your business is what provides you with the edge over the competition.